Two New York Police Department officers were shot dead Saturday afternoon by a man from Baltimore in a planned act of retribution. Ismaaiyl Brinsley, 28, had posted on social media he meant to kill officers. The shooting of officers Rafael Ramos and Wenjian Liu comes in the wake of massive, nation-wide protests of police accountability, but directly goes against what activists have been asking for. The mother and widow of Eric Garner, an unarmed man who died in a police chokehold, have been asking for the protests to remain peaceful. A Staten Island grand jury had decided not to indict the officer responsible for Garner, which sparked a wave of protests. It built upon the unrest from a grand jury’s decision not to indict officer Darren Wilson for shooting an unarmed Michael Brown to death in Ferguson, Mo. The die-ins, marches, and rallies were conducted in a non-violent way until last weekend. Protesters tried to throw a garbage can off the Brooklyn Bridge at police officers below during the Millions March demonstration, and assaulted officers while resisting arrest. Officials, Eric Garner’s family, and civil rights activist Rev. 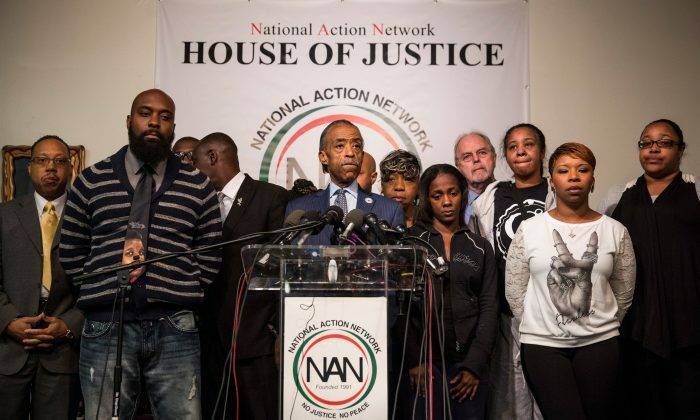 Al Sharpton have denounced and condemned the recent acts of violence. “You cannot put these families rights in a distorted way and then claim you’re trying to fight on their behalf,” Sharpton said at a press conference Sunday. Esaw Snipes, Garner’s widow, and Gwen Carr, Garner’s mother, gave their condolences to the two officers’ families. The attack was the first fatal shooting of an NYPD officer since 2011. Garner’s family repeated their plea for peace. “My husband was not a violent man, so we don’t want any violence connected to his name,” Snipes said. CORRECTION: An earlier version of this article stated police in Baltimore had wounded the shooter’s girlfriend. Ismaaiyl Brinsley had shot his former girlfriend. Epoch Times regrets the this error.